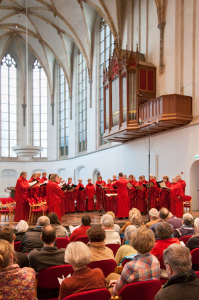 The Schola Davidica choir welcomes (foreign) visitors to join our monthly Choral Evensong on the 4th Sunday of the month (except for July and August) from 5:00 to 6:00 pm in the Janskerk in Utrecht. The choir is conducted by Daniel Rouwkema and accompanied by Jan Hage (organ). Utrecht is located 45 km from Amsterdam (25 minutes by train from Amsterdam Central Station). The Janskerk is within walking distance from Utrecht Central Station. Adress: Janskerkhof 26, Utrecht. Admission free (offertory at the exit).